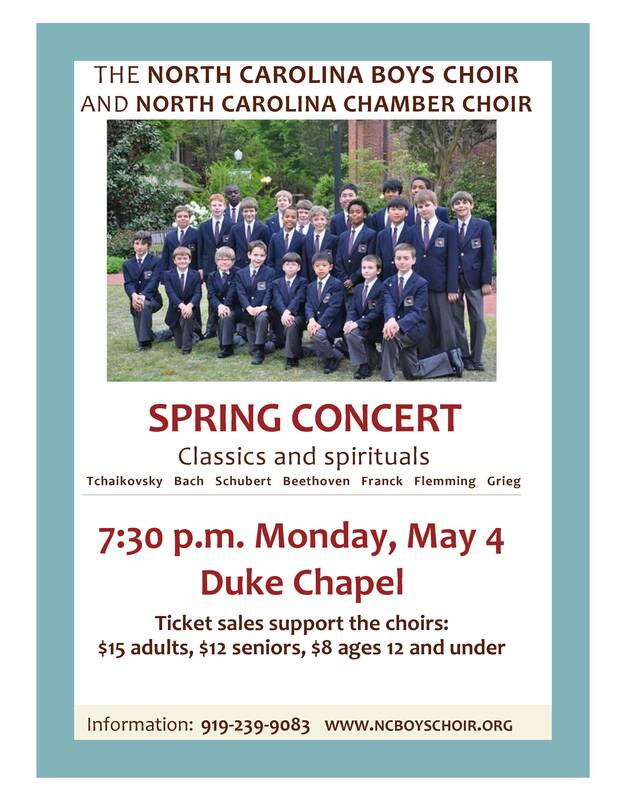 The North Carolina Boys Choir and Chamber Choir welcomed lovers of choral music to join them for their annual spring concert at Duke Chapel on Monday evening, May 4 at 7:30 p.m. The choirs performed a mix of classical choral arrangements by Tchaikovsky, Bach, Schubert, Beethoven, César Franck, Friedrich Flemming, and Edvard Grieg; along with spirituals and American and Irish folk songs. The North Carolina Boys Choir (ages 9 to 14) was joined by its Training Choir for younger boys and girls and by the North Carolina Chamber Choir of Tenors and Basses at the concert. The Boys Choir (Concert Choir) and Chamber Choir together sang selections including “Cherubim Song Number 7” by Dimitri Bortniansky as arranged by Tchaikovsky; “Confitemini Domino (Now With One Accord)” by Alessandro Costantini; “Ave Verum Corpus” by Mozart; “Beautiful River” by Robert Lowry arranged by John Rutter; “A Clare Benediction” by John Rutter; “Sure on This Shining Night” by Samuel Barber set to a poem by James Agee; The spiritual “Keep Your Lamps!” arranged by Andre Thomas; the spiritual “Rockin’ Jerusalem” arranged by Rollo Dilworth; and “The Lord Bless You and Keep You” by John Rutter. The Boys Choir (Concert Choir) sang “Now Thank We All Our God” by Johann Cruger as harmonized by Bach; “Jesu, Joy of Man’s Desiring” by Bach as arranged by Richard G. Appel; “Gloria” from Mass in G Major by Schubert arranged by Walter Ehret; “Panis Angelicus” from Messe Solennelle by César Franck; three American folk songs arranged by Alice Parker, “The Colorado Trail,” “Santy Ano,” and “Shenandoah”; and “Hymn to Freedom” by Oscar Peterson arranged by Seppo Hovi. The Chamber Choir sang “Die Ehre Gottes aus der Natur (The Heavens Resound)” by Beethoven as arranged by Peter Dykema; “The Man of Upright Living” by Friedrich Flemming; the traditional Irish melody “Be Thou My Vision” arranged by Robert Hunter; and “Brothers, Sing On!” by Edvard Grieg arranged by Howard McKinney. The Training Choir sang “All Things Bright and Beautiful” by Cecil Frances Alexander and John Rutter; the spiritual “Steal Away” arranged by David H. Williams; “Brother James’s Air,” a paraphrase of Psalm 23 by James L. M. Bain arranged by Gordon Jacob. The Boys Choir is one of the oldest choral organizations in the area, founded in 1972 as the Durham Boys Choir and designated the North Carolina Boys Choir in 1983 by then-Governor James B. Hunt, Jr. Through the years the Choir has sung with all the area’s major choral groups such as the Duke Chapel Choir, Choral Society of Durham, Choirs of Meredith and NCSU and Chapel Hill Voices. They have also sung with the N.C. Symphony Orchestra in Christmas Pops Concert and the War Requiem in 1983. The Choir has appeared on a number of area TV specials including “Christmas at the Governor’s Mansion” and “North Carolina People with William Friday.” The Choir tours nationally and internationally and has presented concerts in churches and cathedrals in Canada, England, and Scotland. In summer 2014, the Choir sang at Carnegie Hall in New York City. The North Carolina Boys Choir is under the direction of Robert Unger and David Cole.